As well as creating beautiful furniture for homes, restaurants, hotels or offices, London Reclaimed’s raison d’être is youth employment. 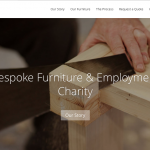 Via education, training and mentoring in furniture making and carpentry these guys in South East London are changing lives for the better. We’re really glad to know them and look forward to seeing them go from strength to strength.